Start off the ABCs the right way, with a ferocious dinosaur! This dino alphabet is a great way to encourage little learners to learn their letter shapes. What better way to learn the alphabet than with the help of a dinosaur friend? Color in this dinosaur "B" as you practice your ABCs. Encourage early literacy, and practice those ABCs! Give this dinosaur "C" some colors as you review the alphabet. D is for dinosaur! Have some fun with the alphabet, and get to know the letter shapes with the help of some dino friends. Practice your dinosaur roar as you recite the alphabet with your little learner! Dino lovers will have a blast reviewing their ABCs with this set of dinosaur letters! Go on a dino adventure with this alphabet practice series! Kids will love coloring the dino-shaped letters as they review their ABCs. Looks like there's a dinosaur in the classroom! Practice the alphabet letters the fun way, with a dino ABC series. Give your little adventurer a fun way to practice ABCs! This dino letter page is a fun way to get kids in the mood for learning. J is for Jurassic! Put a fun spin on alphabet practice with these dinosaur letters. Let's hear a roar of approval for this dinosaur alphabet series! Kids will love coloring the dino "K" as they review their letter shapes. Let's learn the letter "L" with a little help from a dinosaur friend! Color this dino "L" as you practice the ABCs. Meet dinosaur "M"! This letter dino is here to help your youngster practice her ABCs. Learning is much more fun when there are dinosaurs involved! Get to know the letter "N" with this dinosaur letter worksheet. Practice recognizing letter shapes with some familiar dino friends! This dinosaur "O" is a fun way to review the alphabet. Put a fun spin on alphabet practice with this dinosaur "P"! As your child colors the dino letter, she'll be building letter recognition skills. Get acquainted with the letter "Q". This dinosaur friend is looking for some fun colors during alphabet practice. R is for roar! This dinosaur letter "R" is a great way to help your child with letter recognition. Sneak in some alphabet practice with this fun dinosaur coloring series! Color the dino "S" as you review the ABCs. Learn your letters the fun way with a dino alphabet! Color this dinosaur "T" as you review the ABCs. Learn your letters the fun way, with a dinosaur alphabet series! This is a great way to get kids excited about their ABCs. Go wild for these dinosaur alphabet pages! Color the dino "V" as you practice your ABCs. Have a little fun with the alphabet! This dino "W" is a great way to help kids with letter recognition. Here's an EX-cellent way to learn your letters! Color this dino "X" as you review the ABCs with your youngster. You're almost to the end of the alphabet! Have some fun coloring this dinosaur "Y" with your little alphabet explorer. Get excited about your ABCs with a fun dinosaur letter page! Review the ABCs with your child as he colors the picture. D is for dinosaur! These dinosaur alphabet flashcards are perfect for getting little ones excited about learning their ABCs. 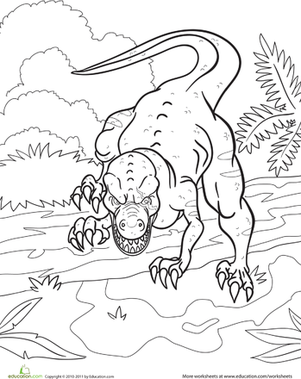 Great for kids that like dinosaurs like the T-Rex; this coloring page features Giganotosaurus! As your child colors he can imagine a story for this huge dino. Is your first grader into dinosaurs? Then here's a coloring page to throw his way of a Protohadros, "duck billed" prehistoric reptile, and her nest! Tortoises lived in prehistoric times, and they looked pretty much the same then as they do today. Get to know this long-living reptile with a fun dot to dot. Learn about the parasaurolophus, one of the most musically inclined dinosaurs with this dot-to-dot coloring page. This angry dinosaur coloring page features a dinosaur that looks like he's ready to attack! But what is he attacking? Let your child decide as she adds color! 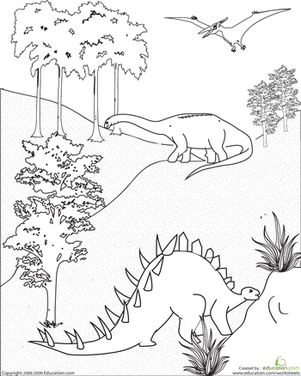 This dinosaur coloring page includes fun facts for your child to learn as he colors. This dinosaur coloring page features three peaceful dinosaurs preparing to eat their daily meal amid a serene landscape. This dinosaur coloring page featuring the Troodon will surely entice and engage the budding archaeologist in your first grader! With a name meaning "large duck," this Anatotitan hatchling could use some color to measure up to the other dinosaurs! Are your crayons ready?